A career minor legauer, Fred Costello signed with the Giants for 1994. Not only did the move take him to his hometown organization, it also, he hoped, might help him accomplish something else, according to The Tucson Citizen. "With Houston, I might have been one of their pitching prospects, but I might have been the 18th or 19th guy," Costello told The Citizen. that April. "I kind of slide in the 14th or 15th spot here. There are three or four guys who may go (to big leagues) before me. I had a pretty decent spring, so you never know what may happen." Costello made AAA Phoenix that year, his second season with time at that level. He went on to play at AAA in one more season, but he never made the majors. 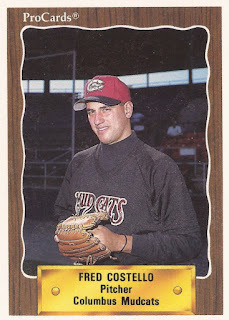 Costello's career began in 1986, taken by the Astros in the fourth round of the draft out of Oceana High School in California. Costello played his first two seasons in the rookie Gulf Coast League, getting 12 starts each year with an ERA of 3.22 in his second campaign. He gave up two hits in seven innings of work in a 1987 game. He moved to single-A Asheville for 1988, turning reliever, and then AA Columbus for 1989 and 1990. He played a limited 1991 at high-A Osceola, then returned to AA for 1992 and got his first 14-start look at AAA with Tucson in 1993. He went 6-2, with a 3.69 ERA there. After pitching at Phoenix in 1994, Costello signed with the White Sox for 1995. Offered a chance to play replacement ball that spring, he refused. The White Sox gave him his release after seven outings. Costello attributed his release later to The San Francisco Chronicle to his refusal to play that spring. He then went to work as a coach for the College of San Mateo. "Fred has such great rapport with our pitchers," San Mateo head coach Doug Williams told The Chronicle that May. "What he has done in his first year as a coach is simply amazing. We lay so much of our groundwork in the fall, and Fred certainly did that before he went to spring training. His potential as a coach is unlimited." Costello has since, however, gone on to a career not as a coach, but as a scout. By 2003, he'd signed on as a scout with the Diamondbacks. He moved to the Nationals in 2010 as an area scout. For 2014, the Nationals named him national crosschecker.